It is AWESOME!! What a work!! Lisa will take photos and send them to you next week. I'm not a camera person, so I'll have to request your patience for a few more days. You can rest assured, though, that everything looks REALLY good! Please feel free to use my name as you see fit. May I make the same request of you?" L.A., California -- update - more tangles for Joe, click here for more. Each tangle is created one at a time, by hand. A compilation of many specially selected for their shape, branches. The tangle is created from the inside, out. Each branch meticulously and, painstakingly joined, one to another in numerous places. This joinery is made to appear as though the branches grew together. 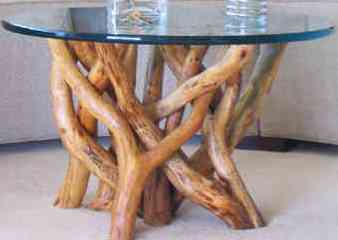 A root table. I hope you enjoy your tangle as much as we do, in preparing it for you. For cocktail tangle cost ranges, click here. 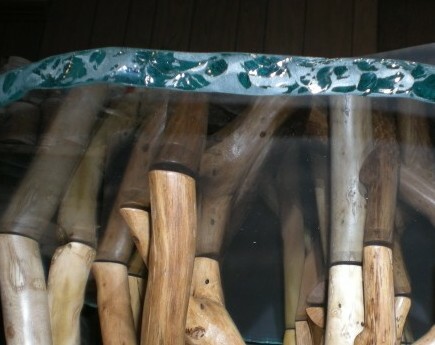 I have created larger tangled root bases for glass tops ranging up in size to 10 foot long and 48 inches wide. Each is created one root and one branch at a time. Glass tops may be cut to shape per your request. A variety of edgings are available. Shown left are a few edgings. Total costs vary with size, shape, glass thickness and edging. Below are a few examples to give you an idea of costs. You may purchase your own glass if you wish. Due to chances of breakage, that is often most practical. Cost estimates, above, include glass with polished pencil edging. Other edging choices are available. On irregular shapes, we are happy to send needed dimensions or templates to your glass supplier for their cutting requirements. Shipping costs are additional for these tables. NOTE: If you have your own glass or wish to purchase locally, that's fine. Let us know and we will adjust costs accordingly. There are a few occasions, on longer tables, where we prefer, to fit the glass to the base. We can discuss that when you contact us. Shipping costs for dining and conference tables - apprx $550.00 using our " blanket wrap " carrier. ( more ) Delivery is to your curbside. Final ship costs are calculated upon completion of table when final weight, dimensions, and, destination address is known. How to contact us - Just use the contact form, below and send us a message. A few of the glass edgings, below. 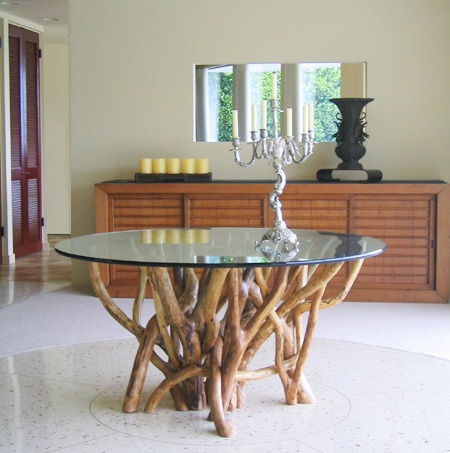 To view a slide show of various tangle table designs, Click HERE. View a page of tangle table photos, HERE.